An annunciator is a type of alarm indicator which provides a visual indication of fault alongside with audible alarm. Under fault conditions, the lamp flashing stars with an alarm. On noticing fault a power engineer pushes a button and the alarm becomes silent. The lamp, however, stays lit. After fault clearance, the lamp turns off. Modern control systems involve digital windows that are used for visually displaying the alarm notifications as well. Busbars are the electrical nodes where power is gathered for distribution or further transmission purposes. Physically the busbar is a metallic rectangular conductor. Circuit breaker plays a key role in protection and control of power systems. 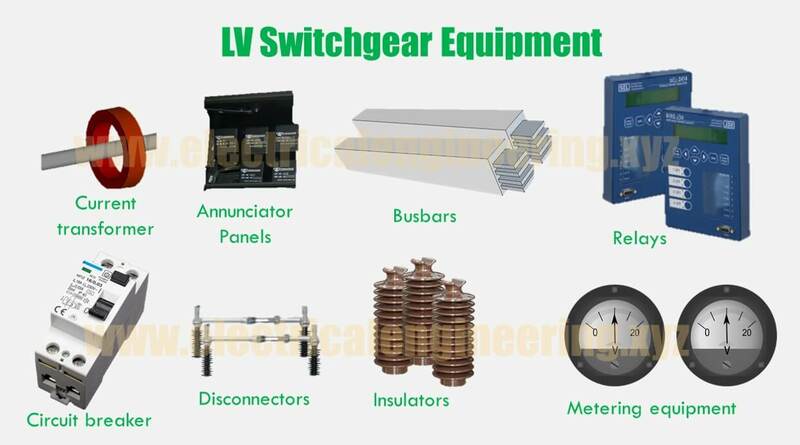 Usually, MCB (Molded case breakers) are employed on LV switchgear. Control relays are used for controlling the electronic circuits. Mostly they are employed in control of other relays. They are used for sensing under and overvoltages and current reversal. A major concern for switchgear designers is insulation. The major reason for insulation is to separate current carrying parts from each other as well as from earth. Air, gases, oils, vacuum, fluids, and solid materials can be used for insulation purposes. The choice of any material depends on the physical conditions. Instrumentation transformers such as current and voltage transformers are used for stepping down the voltages for relays and other control equipment. Metering equipment such as voltmeters, ammeters, wattmeters, DMPS is used for measuring different parameters such as voltage, current, power. Protection relays are used to signal an alarm to elements of power so as to remove the component in case of an abnormal condition. Gas density monitor (In case of gas breakers).